maybe i’ve got a writer’s block… have i got writer’s block? maybe. it’s a sunday, it’s beautiful weather, finally spring is here, the birds are chirping, the sky is blue, the sun is shining… i want to go outside, sit in the sun with my new tortoise shades and just enjoy this day. this afternoon we’ll go search wild garlic (or is it called ramps?) and make some pesto! i hope you enjoy this sunday, too. 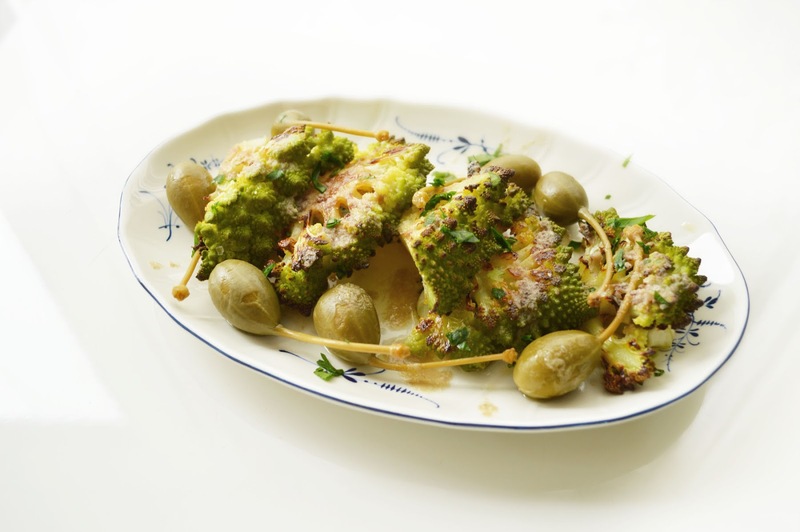 this romanesco dish is so simple, yet transports you to a little street corner restaurant somewhere in italy. 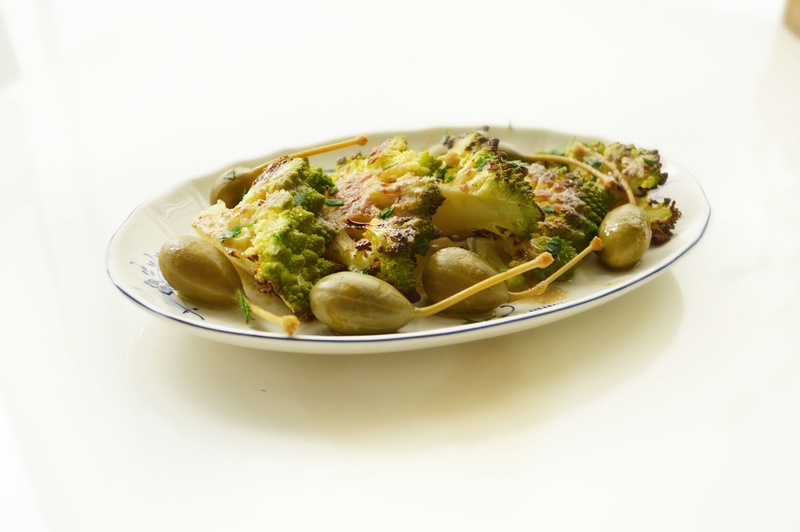 roast the romanesco, to make it crispy and nutty in taste. the combination of lemon, anchovies (i know… sounds gross, but it just adds the little extra kick…) and capers can’t be beat. preheat the oven to 220 degrees c / 400 degrees f and line a baking sheet with parchment. cut the romanesco into fillets (or roses, if you prefer), and brush it with 2 tbps. of the olive oil. sprinkle with maldon sea salt. roast for 20 minutes. slice half the lemon up into thin slices and place it on the pan, too. in the meantime, make the dressing: put the anchovies, the rest of the olive oil and the juice of half a lemon in a blender, pulse a few times to receive a creamy sauce. 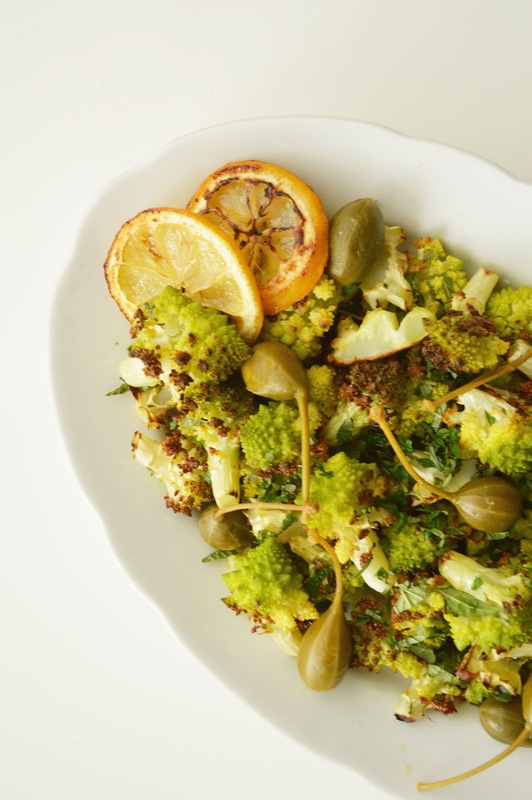 arrange the romanesco on a plate, drizzle with the dressing and sprinkle with some more maldon sea salt if necessary (be careful, the anchovies add saltiness, too) and add a few caper berries. sprinkle with some parsley to add a pop of colour. you can also decorate with the roasted lemon slices. serve warm or at room temperature.